1. Assorted shapes and sizes include: ball, cone, rounded cylinder, flat top cylinder, tapered. 2. Cleaning trimming, veining and weld joint of casting, forging and weldment. 3. Highly recommended for jewelers, lapidary use, hobbies, crafts, craft modeling, home repair and so much more. 4. Great for filing glass, ceramics, tile, brick, plastics, wood, fiberglass, stone, rock carbide, gold, platinum, silver, metals, and anything with a hard surface. 5. They are suitable for polishing metals and plastics. 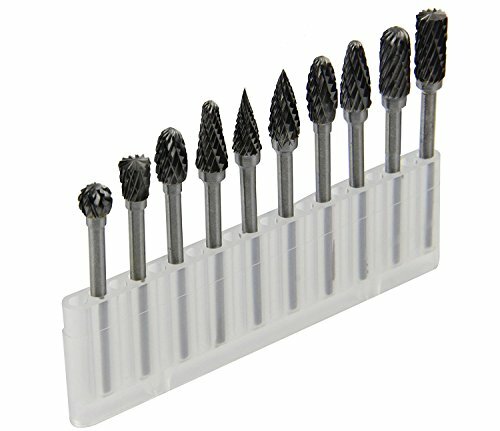 Can be used with most hand power tools, including Dremel, Proxxon, and many others. Material: Tungsten Carbide, Shank diameter: 3 mm(1/8 inch), Cutting edge diameter: 6 mm(1/4 inch), Total length: 50 mm(2 inch).Please check the size before you buy it. Double cut head. Suitable for deburring and polishing cast iron, cast steel, carbon steel, alloy steel, stainless steel and other materials. Excellent for fine detail work, cutting, engraving, carving, touch-up and finishing. Processing all kinds of metal(including all sorts of hardened steel) and non-metal (such as marble, jade, bone), and the machining hardness can reach to HRC70. Generally use with handheld electric or pneumatic tool drive (can also be used in machine tool). The speed of the electric or pneumatic tools usually is 6000-50000 revolutions per minute.